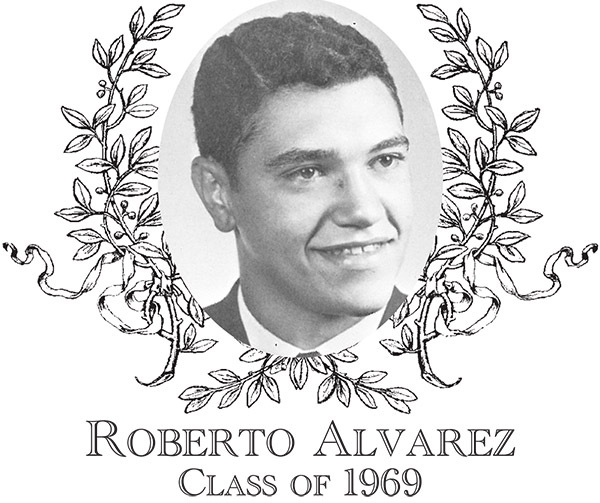 Roberto Alvarez, Class of 1969, was a three-sport athlete participating in soccer, basketball, and baseball. He served as a Captain in all three sports, including the inaugural BHS soccer team his senior year. Roberto had plenty of natural athletic talent and exuded a great sportsmanlike positive attitude and dedication to the Green and White which finally culminated into him earning the prestigious Finnegan Award at graduation as the most outstanding male athlete. During his career, his teams made six District Tournament appearances. A tireless athlete, Roberto's first love was baseball. He was the first freshman since 1946 to wear a Green and White uniform as a starter, playing shortstop and third base. He was a flashy fielder who also hit for an average of .304 for an 11-1 team his freshman year. Overall, Bartlett baseball teams achieved a record of 46-13 during his tenure on the diamond. The talented defender would later finish his career as a first baseman. Hall of Fame Coach Don Cushing stated "Roberto was a terrific ball handler and playmaker; was known for his blind passing ability, penetrating drives, and outside push shots, and was our team's most serious scoring threat from the outside. Blessed with good speed and jumping ability, he pulled down his share of rebounds and was the key to our fast break his entire career." Beyond the athletic arena, Roberto was a leader in the school, serving as Student Council President his senior year. After high school, Roberto attended Nichols College, earning a degree in Marketing. Roberto retired after a 32 year career with IBM. He and his wife Marcy live in Richmond Hill, GA and they have two children, Matthew and Rebeca.